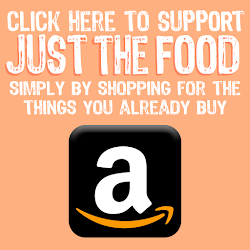 justthefood.com...the blog: What Should I Get My Vegan Friends for Christmas? Vegan Cookbooks! Duh! What Should I Get My Vegan Friends for Christmas? 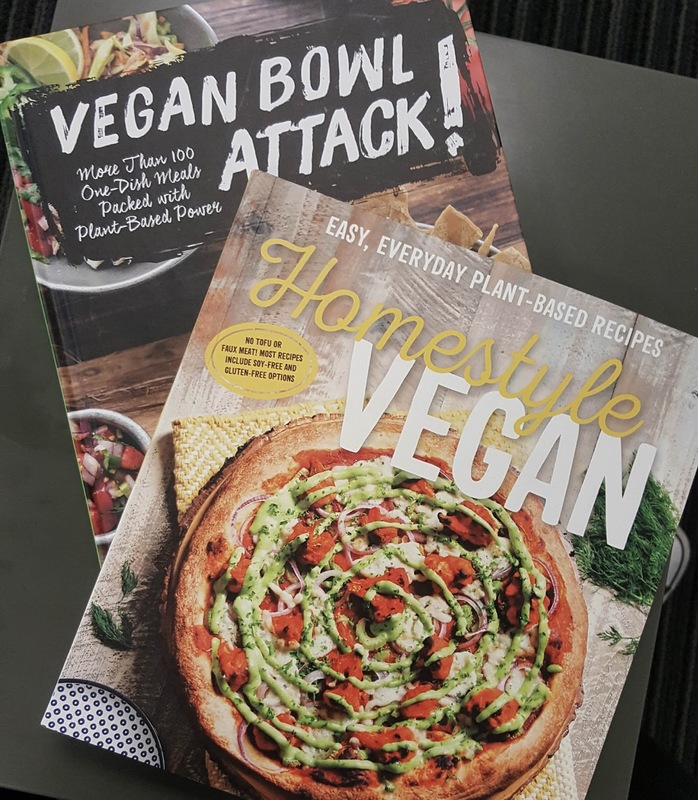 Vegan Cookbooks! Duh! Read all the way to the bottom of this post where you can enter to win a copy. I am giving away a copy of each of these books, so just follow the prompts in the widget to enter! For many of us, the Holidays are no longer about presents, like they were when we were kids. As a grown up I really enjoy the opportunity to meet up with friends and family over a drink, or a meal, and really spend quality time together joyfully in the spirit of the season. Don't get me wrong, I absolutely love the holidays! The amount of decorations that adorn my 700 square foot home is ridiculous and Christmas music blares from my car stereo as well as my house all month long. It's just the buying of "stuff" for the sake of buying "stuff" that really gets to me. If your vegan friends are anything like me, they don't want any more stuff. No more lotions, body washes, or candles. (Because there's a good chance they contain some sort of animal product or were tested on animals and aren't a suitable gift anyways, so...) No more trinkets, picture frames, or bric-a-brac that cannot be used. (Because quite a few of us really are trying to cull down and simplify, getting rid of "things" we don't need.) And unless you know we collect or have an appreciation for a certain vintage era mushroom shaped salt and pepper shaker set, please, just don't waste your hard earned money buying us any more stuff. Thankfully my family has pretty much sided with me on this one. The kids, of course, still get gifts, but the grown ups have a strict if-you-didn't-make-it-yourself-you-aren't-allowed-to-give-it stance. Which means, a lot of us make food gifts. Cookies, candies, Orange Chipotle BBQ Sauce, Spicy Dill Pickles...all kinds of yummy stuff. My sister even takes it up a notch with non-edible home made bath salts and body sprays made with essential oils. But you get the idea, right? Now, before I keep going, I want to say that I don't hold it against you or your family if you still give gifts. If that's your thing...awesome! Have fun! And if there are any vegans on your gift list this year, give them the gift that will keep on giving for years to come; A vegan cookbook! Because cookbooks, my friend, are not junk. They are romance novels full of tasty delights. 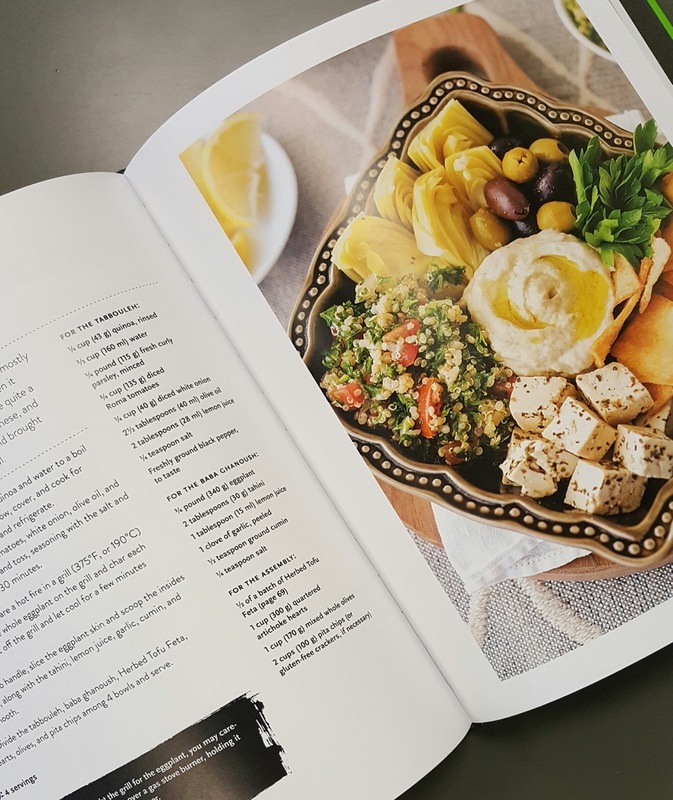 A good cookbook, like any good book, will whisk you away into a fantasy land where finishing salts and dreamy sauces dance together to create culinary masterpieces. For this post I am going to feature two of my favorite vegan food bloggers turned cookbook authors. They are both amazing ladies (and I am lucky to also call them friends!) who not only create delicious vegan food, but capture it beautifully through their breathtaking (not to mention mouthwatering) photographs. 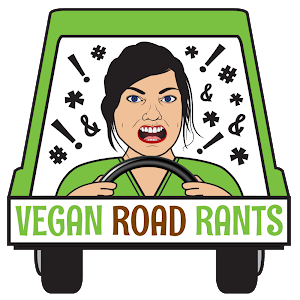 That's right, folks, I am talking about the impressively talented, sassy, yet refined, thoughtful, creative, and funny Amber St. Peter of Fettle Vegan and Jackie Sobon of Vegan Yack Attack. Both of these ladies dropped a major flavor bomb on us this year with their new cookbooks and both of them were gracious enough to allow me to share a recipe with you. I'll start things off with Amber's Homestyle Vegan. If you don't already follow Amber on Instagram you really should. Her posts are always colorful and full of incredible photography. And if you don't follow her blog, Fettle Vegan, you are really missing out on a lot of recipes, product reviews and more. I highly recommend subscribing! I would consider Amber's style of cooking to be classic comfort foods with a healthful twist. She's really incredible at veganizing traditional family favorites, effectively turning them into new and healthier classics without sacrificing any of the flavor. In her new book, she dives right into the recipes! No long intros about ingredients or technique (which I happen to love reading, but in this case it works nicely so that there are no pages wasted on text and instead the focus is on the recipes and the gorgeous photos.) As you flip through the pages, you will notice the high gloss pages filled with a lot of pictures. Pictures, are in my opinion, crucial in a cookbook. This book does not disappoint with a PHOTO OF EVERY SINGLE RECIPE! The chapters are laid out in a refreshingly different way. Instead of the standard morning to night, she starts with breakfast, but quickly moves to hearty entrees. Then it offers up food to feed your friends (though I might argue every recipe in this book is shareworthy! ), crowd pleasers, straight up comfort classics, baked goods, bevvies, and finishes it up with pantry basics. The technical stuff: The recipes are very well thought out and laid out nicely on the page. No flipping pages to finish the recipe. Each recipe gives the ingredients in Metric as well as Imperial measurements, which is super helpful for ingredients like flours who are more actually measured by weight than by volume. The book is also bound beautifully. The pages are sewn in, so no worries about the pages coming loose with lots of kitchen use. This method of binding also makes it so the book lies flat on the counter. Even better! Now let's talk about the food. Amber has done an amazing job of recreating her favorite childhood comfort classics with a healthier, vegan twist. And she does not leave out any of the flavor! So far I've had the Bacon-Less Baked Beans, the creamy Tomato Basil Soup, the Jalapeno Cornbread, the Sloppy Chicks, and the Chocolate Chip Cookie Bars. Every single dish has been perfect! Overall review: 5 big fat stars! The food in this book will satisfy even the pickiest of palates. The recipes are straightforward, easy to follow and most ingredients can be picked up at your local supermarket. 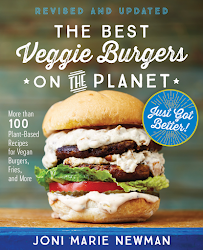 Buy this book for new vegans, seasoned vegans, non-vegans looking to add more plant-based recipes to their repertoire and every vegan you know's mom who never knows what to make when the kid comes over. 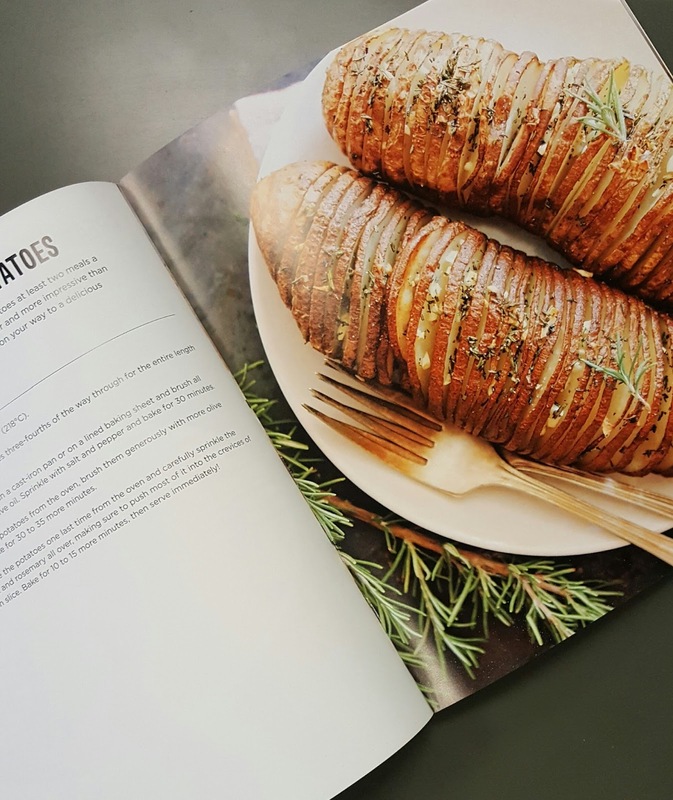 Amber was kind enough to share a recipe from the book with us to get you as excited as I am about this book! 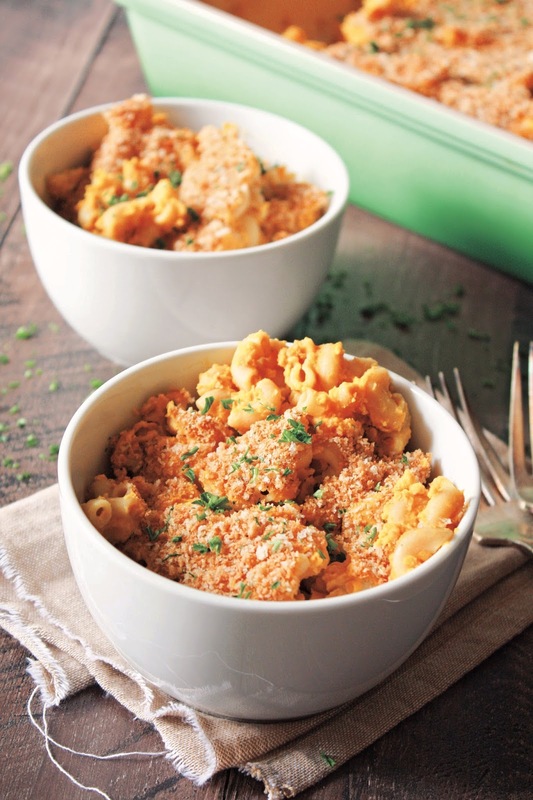 Lo and behold, Amber's Baked Butternut Squash Mac 'N' Cheese. Try not to lick the screen, okay? Photo by Amber St. Peter. Reprinted with permission from the publisher. My mom made a mean baked mac ‘n’ cheese when I was a kid. Cheesy, ooey-gooey and covered in crispy bread crumbs—it was one of my favorite meals! This butternut squash version blends the sweet and savory flavors of winter squash into a cheesy sauce to make a meal that’ll totally take you back to childhood. I covered mine in bread crumbs, too. Mom would be proud! Preheat the oven to 400ºF (205ºC). Line a baking sheet with parchment paper. Spread the cubed squash onto the baking sheet. Drizzle with the olive oil, sprinkle with salt and pepper and bake for about 30 minutes, flipping halfway through, until fork-tender. Keep the oven on. While the squash roasts, bring a medium pot of water to a boil. Pour in the elbow noodles and a pinch of salt and bring back to a boil. Cook for 6 to 10 minutes, until al dente. Strain and set aside. When the squash is ready, pour it into a high-speed blender or food processor along with the almond milk, nutritional yeast, lemon juice, Dijon mustard, garlic, turmeric and 1 teaspoon each salt and pepper. Blend until smooth, then pour the mixture over the cooked noodles and stir to combine. Pour the mixture into a 9 x 13-inch (23 x 33-cm) baking dish, top with the bread crumbs and bake for about 15 minutes, or until the mixture is bubbling and golden. Serve with a sprinkle of fresh parsley! Creamier mac more your style? Skip the baking! 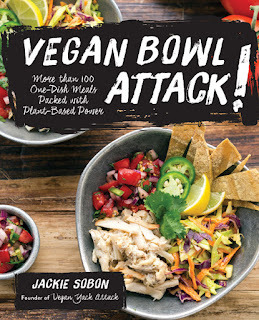 Next up is my girl, Jackie Sobon's new book Vegan Bowl Attack! You guys, it's like she took all of your favorite foods and turned them into bowls you can cozy up on the couch with while you're binge watching Netflix! 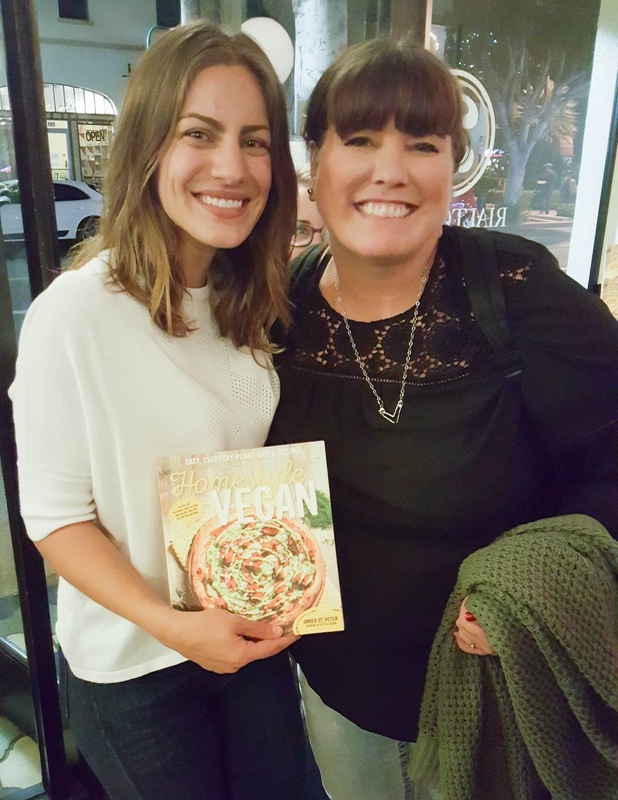 If you are a fan of Jackie and her wildly popular blog Vegan Yack Attack, you know what to expect from her first cookbook: In your face flavor, recipes that are straightforward and easy to follow, and dishes that attack your tastebuds. It's no surprise Jackie has over 50,000 followers on instagram! In Jackie's new book, she attacks the bowl trend with a twist. Instead of simply giving you an entire book of grains+protein+veg+sauce (which she gives the formula for in Chapter 1 of the book) she gives you far more intriguing dishes that happen to be best served in a bowl! Jackie makes a short intro and then gets straight to bowling. Starting with breakfast bowls and then works her way through the day; Snacks, soups, salads, entrees, and desserts. 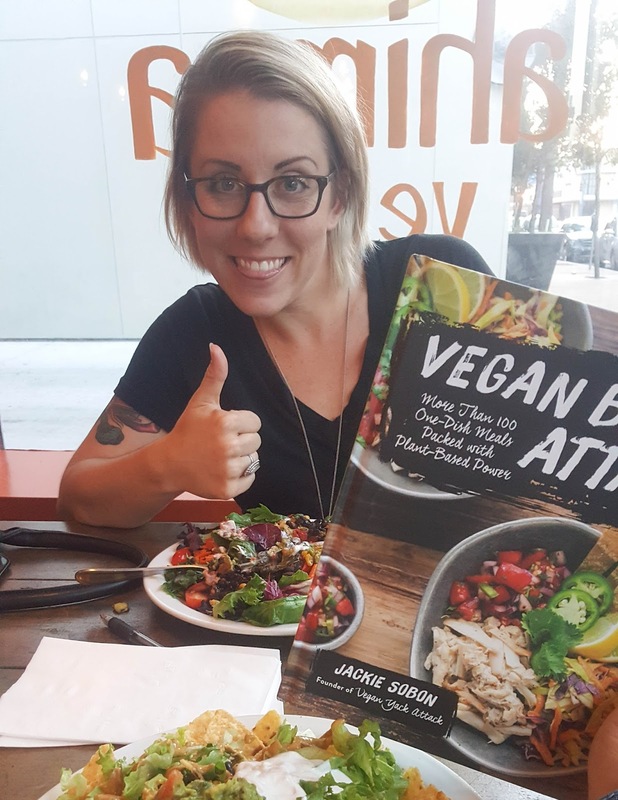 She finishes of with a "Bowl Essentials" chapter that gives you recipes for the basics (bbq sauce, ranch, seitan, tempeh bacon...) Not a lot of filler text here, just recipes and photos. Lots of mouthwatering photos. The technical stuff: This is a hardcover book, so it's very durable in the kitchen, with lightly glossed pages that hold up to spills and splashes, but aren't so shiny they cause a glare when reflecting the kitchen light. The recipes are laid out nicely on the page with each recipe noting whether it is soy free, gluten free, or nut free, making it easy to pick out the perfect recipe for those with allergies or other dietary restrictions. Ingredients are given in both Metric and Imperial measurements. I have loved everything I have tried so far. This book is so fun. I especially love the creative recipes for things that wouldn't traditionally go in bowls, like the Chai Waffle Stick Dippers and the Mezze Fusion Bowl. So far my favorite recipes have been the Biscuit Nacho Bowl, Spicy Sushi Bowl, the Smoky Corn Chowder, the Buffalo Chickpea Mac 'n' Cheeze Bowl, and the S'mores Pudding Bowl. My absolute favorite so far is the White Bean Beer Fondue! Jackie also gives a ton of recipes within recipes, so there are hundreds of recipes and combinations that can be used in and out of a bowl. Her ranch dressing is so good. Overall review: 5 big fat stars! The layout is easy to follow. The photography is stellar. The recipes are delicious. I highly recommend this book to new vegans, seasoned vegans, and omnivores looking to add some tasty plant-based recipes to their repertoire. This book is especially good for vegans who cook for non-vegans regularly. The food will not disappoint meat eaters, in fact, it might even get them to eat a few more meatless meals. 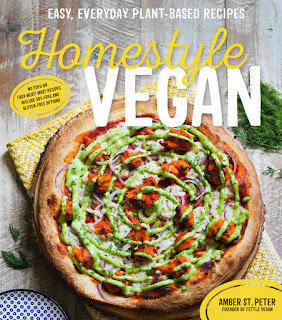 It's a great, well rounded, vegan cookbook with recipes everyone will enjoy. Jackie was kind enough to share a recipe with us to show you just how fun bowling can be! 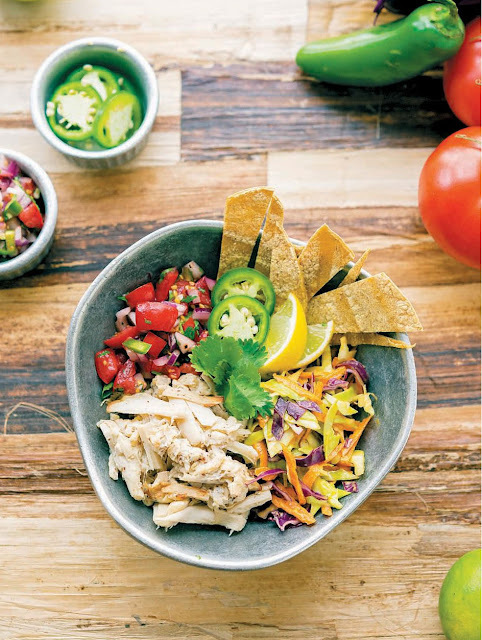 Check out this uber-creative "Fish" Taco Bowl! "Fish" Taco Bowl by Jackie Sobon from Vegan Bowl Attack. Photo by Jackie Sobon. Reprinted with permission from the publisher. To make the cabbage slaw: Place all of the ingredients in a bowl, stir together until combined, and then refrigerate for 20 minutes. To make the pico de gallo: Place all of the ingredients in a bowl, stir together until combined, and then refrigerate for 20 minutes. To make the “fish”: Preheat the oven to 350°F (176°C, or gas mark 4) and coat a baking sheet with a thin layer of oil or nonstick cooking spray. In a mixing bowl, using two forks or your hands, pull apart the hearts of palm until they appear shredded. Stir in the lime juice, dulse flakes (see note on page 104), and salt until combined and then spread the mixture out on the baking sheet in a single layer. Bake for 12 to 15 minutes until the edges start to turn golden brown. To assemble: While the “fish” is baking, place the tortilla strips on a baking sheet, brush with a thin layer of oil, and sprinkle with salt. Bake for 10 to 12 minutes until crispy. Divide the slaw, pico de gallo, “fish,” and tortillas among 4 shallow bowls, arranging the components in quadrants. Nestle the cilantro, jalapeño, and lime wedges in with the tortilla strips. Serve immediately. My favorite right now would be a bowl with sushi rice, Korean ribs (modified a vegan fried rib recipe to include Korean flavors and topped it with a spicy homemade Korean bbq sauce,) bean sprouts, cucumber slices, radishes, broccoli, green onions, and lots of vegan kimchi. My favorite bowl is the hummus bowl from Isa Does It! A good creamy pasta bowl with loads of raw veggies so good! My favorite meal served in a bowl is probably my morning oatmeal with cinnamon and blueberries. I never used to enjoy oatmeal, but have truly grown to love and appreciate it. Thanks so much for the chance to win! My favorite meal is probably stuffed cabbage rolls and in a bowl soup, I'm actually terrible at making bowls or rather sauces that tie everything together It's usually a hot mess when I try to wing it! I'm all about grain bowls...rice or quinoa, beans, roasted veg, greens, and am awesome sauce! slightly embarassing but if i'm being honest, i love a huge bowl of mashed potatoes and stuffing. CARBS! I'm all about macaroni and cheese in a bowl. Best comfort food ever! Oldie but goodie: vegan burrito bowls are my favourite 'bowl meal'. They're just so satisfying thanks to the mix of beans, grains and salsa. Cashew chili. I'm obsessed with warm comfort food right now. I always liked the idea of ratatouille, but my dislike of bell peppers and noticeable levels of onion got in the way of actually wanting to eat it; my original intent was to create something similar: eggplant, tomato, olive oil (a LOT of olive oil), garlic, zucchini, pine nuts and olives.That plus some pasta covers pretty much all my needs. I don't know a lot of "bowl" recipes.. so this would be great! I really like gardein's stew recipe. I love any bowl that has a spicy sauce. I love a mash of potato/celery root/yellow carrots. For a quick meal I love roasting organic broccoli with chickpeas and serving it over brown rice with some goddess dressing. Having that for lunch today! So easy and tastes amazing!! Everything tastes better in a bowl! My favorite bowl right now is with a bed of greens and/or some kind of grains, hummus, sauerkraut, steamed broccoli, baked tofu, lentils and fresh dill. Yum. Both cookbooks look so beautiful! Tofu scramble with a side of kimchee. I could (and do) eat that every day! My fav is a hoppin john bowl. (Brown rice, smoky black eyed peas, steamed kale, tomato/scallion salsa and a spicy creamy sauce. I love this website. Thank you for sharing good idea.I love any bowl that has a spicy sauce. That's why i like your post. presenting thing with different way is your skill. real nice book..i must buy this book and try all your recipe.. I'm actually terrible at making bowls or rather sauces that tie everything together It's usually a hot mess when I try to wing it..